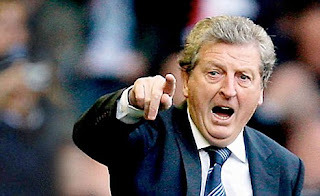 England coach Roy Hodgson has named a suprising 23 man squad for euro 2012. Liverpool striker Andy Carroll was included in the squad with Arsenal rockie Alex Oxlade-Chamberlain also handed a surprise call-up for Euro 2012 as Rio Ferdinand was made the big-name casualty in Roy Hodgson's 23-man England squad. The 33-year-old is a surprise omission but Chelsea's John Terry has been named in a squad despite his upcoming court case over his race row with Rio's brother Anton. As expected, Wayne Rooney is selected despite being suspended for the first two games of England's Group D campaign, against France on 11 June and Sweden four days later. As well as including Arsenal winger Oxlade-Chamberlain, Hodgson also opted to call up another rookie - Norwich goalkeeper John Ruddy, who will battle Robert Green to be Joe Hart's understudy. Ruddy will go ahead with his wedding on June 2, which was booked last year when he wasn't even considered for international duty. Other players called up in are Liverpool winger Stewart Downing and Manchester United striker Danny Welbeck as well as Theo Walcott, Ashley Young and Jermain Defoe who has not played a competitive match for England since September 2010. Steven Gerrard was also been confirmed as captain for the tournament. Birmingham goalkeeper Jack Butland is among the list of five standby players, which also comprises Adam Johnson, Daniel Sturridge, Phil Jagielka and Jordan Henderson. England squad For EURO 2012. Goalkeepers - Joe Hart, Robert Green, John Ruddy. Defenders - Leighton Baines, Gary Cahill, Ashley Cole, Glen Johnson, Phil Jones, Joleon Lescott, John Terry. Midfielders - Gareth Barry, Stewart Downing, Steven Gerrard, Frank Lampard, James Milner, Alex Oxlade-Chamberlain, Scott Parker, Theo Walcott, Ashley Young. Standby - Jack Butland, Phil Jagielka, Jordan Henderson, Adam Johnson, Daniel Sturridge.